Apple’s iPhone remains the most popular camera used by the Flickr community, the photo-sharing site revealed today in its annual review of camera rankings and top photos. This year, the iPhone beat out other camera makers – like Canon and Nikon, the number two and three respectively – by accounting for 54 percent of the top 100 devices used on the site, the company found. 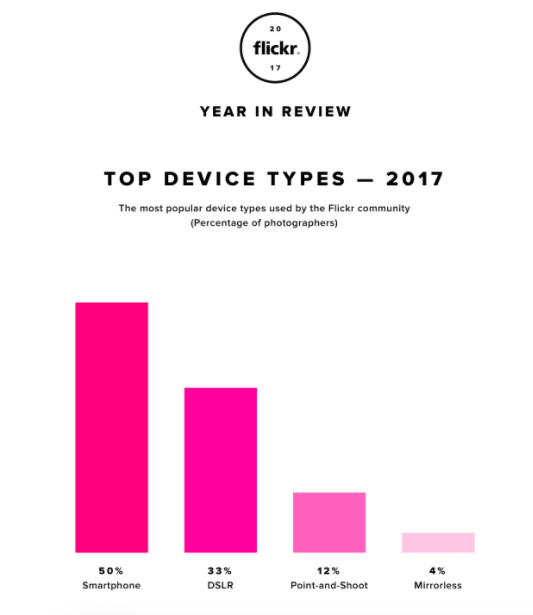 In addition, all top 10 devices of 2017 were iPhone models, Flickr says. The site’s still sizable community of over 75 million registered users offers a good gauge of what devices people today use to take photos. Over the years, the top device has consistently been the iPhone – an indication of how consumers have moved away from traditional point-and-shoots for everyday photos. Many professionals also often turn to iPhone for their higher-quality photos thanks to Apple’s improvements to the smartphone’s camera. The camera system on iPhones, in fact, has become a central focus for Apple’s technological advancements over the years, and has consistently remained of the top reasons to upgrade to the latest iPhone model. That remained true in 2017 as well, with the release of the iPhone 8 and iPhone X. 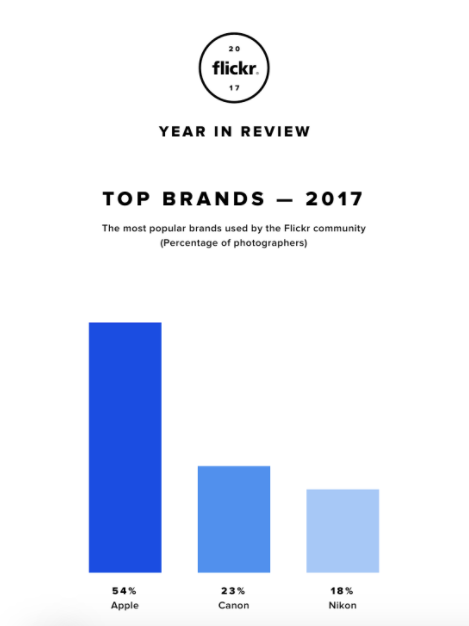 In addition to the iPhone’s top ranking, Flickr’s list this year also shows the impact of smartphone use on the photography industry in general. The smartphone has become the dominant device choice by volume of uploads, Flickr notes. This past year, smartphones accounted for half (50%) of all photos uploaded to Flickr, topping last year’s figure of 48 percent. DSLR usage has increased as well, up from 25 percent in 2016 to 33 percent in 2017. The rise of smartphones and DSLRs have come at the expense of point-and-shoots in 2017. This category has seen the biggest drop of the year at 12 percent down from 48 percent in 2016 – a massive decline. Meanwhile, mirrorless remained at 4 percent of the total uploads for the third year in a row, the report stated.